Walking around the pure whitewashed building housing Fig & Olive, I was reminded of the thick, white walled, red tiled roofed villages all along the shores of the cobalt blue Mediterranean Sea. Upon entering, the interior walls, table cloths and napery, and the ceramic service all continued with this pure unpigmented theme. However, unlike at the Royce in the Langham Hotel which is almost totally white, Fig & Olive’s monotone is softened by earthy browns in the guise of brown terracotta tiles in the small backroom, warm oak wood flooring in the long bar area, and a wood paneled ceiling in the main dining room which also sprouts a good sized olive tree. 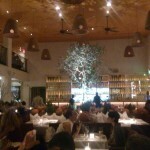 The superior lighting is mostly recessed, indirect lighting that throws a warm glow, and of course the lone, live olive tree is spot lighted with intense halogen lights as a centerpiece to emphasize that there really is an olive in the name Fig & Olive. Also, figs and olives are grown throughout the Mediterranean region, thus acting as a unifying leitmotif for all the cultures surrounding the great inland sea. One wall of the main dining room is covered with votive-looking candles which evoke a feeling of the sacred. Most of the clientele seems to be in their 30’s and 40’s, professional, casual, but well-dressed with an air of assurance that comes from acquiring a patina from life experience. 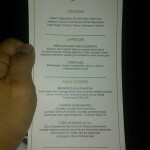 The LA Beat was invited to sample the new fall menu by Executive Chef Pascal L’Orange. The basis for the fall menu is fashioned around the cuisine found around the Cote d’Azur, which includes famous places such as Cannes, Nice, and the independent principality of Monaco. Some aspects of the cuisine Francaise presented seem to be influenced by the Cuisine Minceur (slimming cuisine) established by Michel Guerard. There is definitely a lightness to the sauces, which are used sparingly. Plus, most of the oil used is the healthful olive oil which is a monounsaturated fat and may increase beneficial HDL levels. 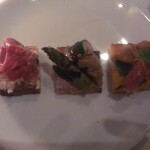 Our first appetizers were a trio of crostini. Grilled olive oil brushed grilled asparagus heads, baby zucchini, and mushrooms were placed on top of ricotta cheese tapenade slathered small squares of toast. The seasonings were subdued to emphasize the subtle taste of the grilled vegetables with a touch of salty dairy to round out the flavor profile. The second crostini consisted of heirloom carrots, which seemed marinated in a sweet, tomato/vinegar sauce. Charmoula, a Northern African paste that may include garlic, coriander, lemon juice, cumin, pepper, and paprika, looked like a green puree that went over toasts spread with a carrot tapenade. Although I am generally an omnivore, I really liked the complex herbal flavours that ran through my mouth as I enjoyed this amuse gueule. The third and final crostinig was Pata Negra, the “black foot” pig that is made into the exemplary Jamon Iberico (Iberian Ham). The best is called Jamon Iberico de Bellota which is aged for 36 months, and the pigs are allowed to graze through the Spanish oak forests where they fatten up on acorns so that even their fat is full of the more healthful omega 3 oils. Shavings of the Pata Negra were placed over toasts that also had a puree of tomato, peach, Parmigiana Reggiana, and ricotta. The Pata Negra was meaty with a full cured umami richness that was enhanced by the aged Umami of the cheeses and refreshed by the tomato/peach. 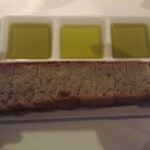 Next, we were invited to taste a variety of olive oils with a medium dense, moist rosemary scented bread. The Arbequina is a type of olive grown mostly grown in Catalunya, Espana which seemed to taste bitter, green herbal, peppery, green wood, and very buttery. The Coratina is an olive grown in Puglia, Southern Italy, where it is the largest producer of olives in the country, and tasted light, slightly peppery,and buttery sweet. The Picual is centered around Jaen, eastern Andalusia, Espana and tasted bitter, burnt/smoky, and oaky. From the list of starters, I chose the Crab Cake that pretty much looked like a Maryland crab cake. Patties of minced crab meat held together with a herbed binder such as white of egg, were breaded and pan fried. Julienned red bell pepper, and a sprig of cilantro were festooned atop the crab cakes while the crab cakes themselves were seated on a smear of red bell pepper based aioli. Wedges of lemon were provided to add more gastrique to the crab cakes and enliven the delicate sea taste. 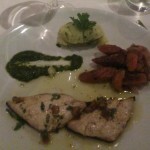 One of the mains, Branzino (Mediterranean Sea Bass), is fileted and lightly cooked on a “plancha” or grill. The texture of the branzino is soft, velvety, moist, and cushy. A smear of Charmoula is again applied to the branzino to wake up the latent flavours as well as to add herbal complexity. There is a bit of Sauce Vierge, or “Virgin Sauce,” which is diced tomato, lemon juice, and basil in olive oil artfully scattered on the fish. The starch is olive oil and chive mashed potato. The vegetable is braised sweet carrots. All the flavors of this dish except for the Charmoula is light, delicate, and nuanced. All the above dishes were paired with a Chardonnay, Les Setilles, Olivier Leflaive, Bourgogne, France 2011 which was a light golden yellow, slight oak, sour apple, light pineapple/quince with a slightly raspy acidic minerality that served to clear the palate. The next main was a 36 oz. 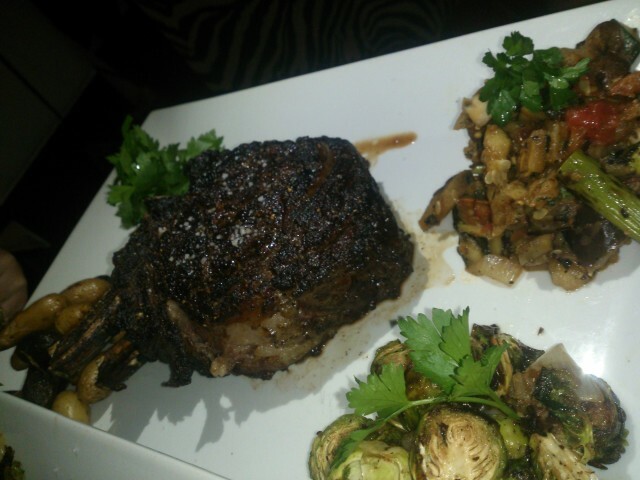 Cote de Boeuf, a Painted Hills Farm bone-in rib eye served with marble heirloom potato, short rib jus reduction béarnaise, and Arbequina Olive Oil with a choice of two sides, which were small mélange of new potatoes, and grilled Brussels sprouts. An extra side of slowly braised vegetable ratatouille also graced this dish. The thick rib eye steak was seared on the outside for a nice char and a 1/4″ outer edge that was done. The center was a dusky rose . It made for a nice contrast of the meat being soft, velvety, and moist in the inner portion, while the outer, more cooked layer had a meaty toothsomeness. 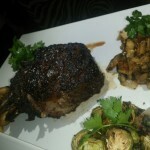 The Cote de Boeuf seemed lightly brined in salt to add more flavor and moistness. The seasoning was light to let the grass fed flavor infused meat shine through. For those who wanted to add a creamy herbal gastrique, there was a drizzling of a more acidic vinegar inflected egg yolk/olive oil emulsion with infusion of estragon/tarragon, better known as Sauce Béarnaise. The side dishes were lightly herbed and salted to act more as a palate cleanser in between bites of the rich beef. Our hard working Italian waiter suggested a Cabernet Sauvignon, Oberon, Napa Valley, California 2011 to pair with the Cote du Boeuf, which had blackberry, blueberry, cassis with a jammy bouquet. It had lower tannin, but the acid balanced the more jammy flavours of the dark fruits for a more refreshing finish. The jammy aspect of Oberon added to the rich beefiness of the Cote de Boeuf. We finished with a Green Apple Sorbet which tasted mildly sour and acidic. It was accompanied by orange slices and pink grapefruit segments with a scattering of thinly julienned spearmint. 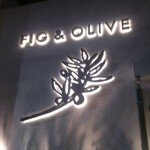 A small vial was filled with Italian Nocellara olive oil and possibly a light tasting honey, and was syrupy and viscous. This emulsion could be poured over the fruits as an added sweet, buttery and mildly oily option. This dessert was a refreshing, palate cleansing end to an enjoyable meal. None of the courses were drowned in heavy sauces. Instead, much of the meal adhered to the “Mediterranean diet” where olive oil, fish, vegetables, and grains are the primary ingredients. Only the Cote de Boeuf was out of bounds, but very much appreciated for adding a carnivorous dimension to an excellent meal. 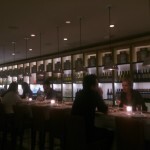 Chic, au courant, with a touch of insouciance, Fig & Olive presents itself as a French influenced restaurant that speaks in a California inflected culinary patois. A gourmet since the mid 1970s, Gary Idama has an extensive knowledge of a variety of cuisines, but is partial to Japanese food. When Gary reviews restaurants, he looks for good food and drink, good bang for the bucks, a clean eatery and kitchen, plus knowledgeable and enthusiastic service. 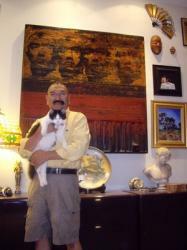 He is a member of Yelp's Elite and spends his time at restaurant and cultural events, hanging out with friends, and attending Sake/Wine tastings. His last meal on earth would be Omakase with premium Sake at Mako Sushi in Little Tokyo and maybe a little salted, preserved Fugu ovary with a Napa Pinot Noir.